Brian and Moira Gittos: The Goldsborough Effigies. Describes two early 14C military effigies detailing their armour and the setting of the two monuments. 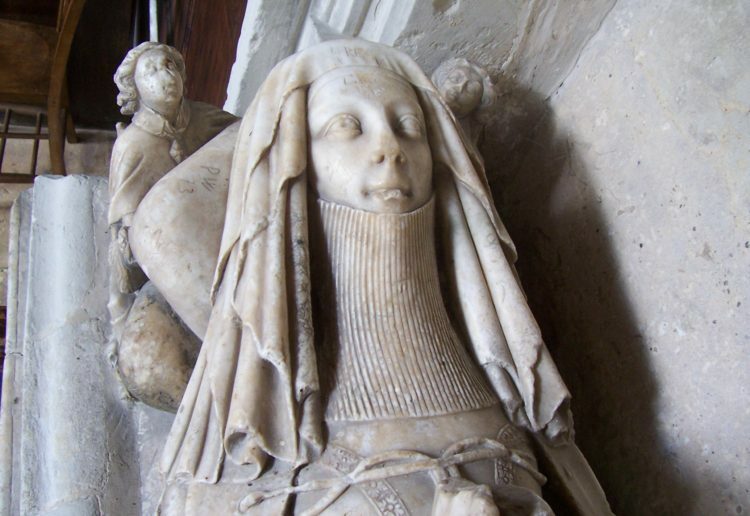 The genealogy of the Goldesburgh family is investigated and the two effigies identified. Claude Blair: The Wooden Knight at Abergavenny. Examines early references to effigy. Discusses generally the bacinet worn under mail hood and the poleyns. Confirms identification of John 2nd Baron Hastings d. 1325. Identifies tomb-chest panel in the church as belonging to original memorial and suggests that the monument was in the form of a ciborium. 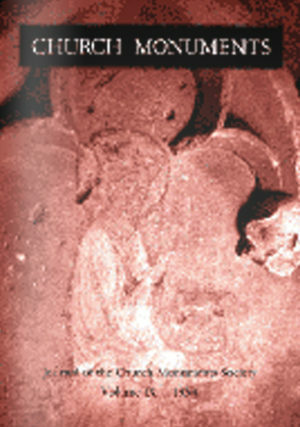 An appendix describes the paint found by conservators. Pauline Routh: Yorkshire's Royal Monuments: Prince William of Hatfield. Discusses the date of the 14C monument and its various locations in York Minster. Adam White: The Booke of Monuments Reconsidered: Maximilian Colt and William Wright. Discusses the manuscript in the College of Arms which was created to record the approval of heraldic and genealogical information on proposed memorials. William Wright is discovered as the probable designer of the Hertford monument at Salisbury c.1621. Terry Friedman: Modern Icarus, or the Unfortunate Accident. Recounts the death of Robert Cadman who fell while performing on a rope stretched from the spire of St Mary’s church, Shrewsbury in 1740. Ingrid Roscoe: The Monument to the Memory of Shakespeare. Recounts the raising of funds to commemorate Shakespeare in London through benefit performances. Installed in 1741, the monuments by Peter Scheemakers was popularly received and inspired a Shakespeare revival and the placing of his statue in theatres and other locations. Scheemakers became most popular sculptor overshadowing Rysbrack. John Lord: Repairing and Cleaning of the Said Burying Places. Gives an account of the commissioning and siting of monuments to Disraeli, Gladstone, Salisbury and Campbell-Bannerman paid for by Parliament.